Download "Word of Faculty Of Mass Communication, Cairo University"
1 Word of Faculty Of Mass Communication, Cairo University A word. 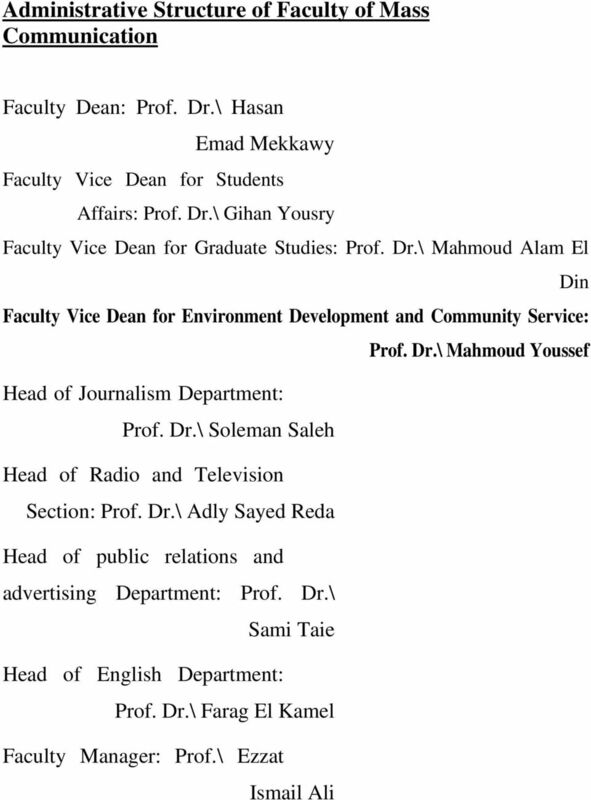 D. Hassan Emad Mekkawi Irons Dean of the Faculty of Mass Communication Dear colleagues, members of the Faculty of Information and their assistants and staff and workers. Children loved the students of the Faculty of Information old and new congratulate all of the academic year 2011/2012, it is generally not a whole year, it is the first year after the eruption of the Egyptian revolution great revolution of January 25, 2011, that revolution unleashed by the young people free, and the participation of all segments of the Egyptian people, Zllaha protection and our valiant armed forces. Seeking a peaceful revolution for freedom, equality and social justice. The students were our university traditions, and students of our college dear fuel of this great revolution, which saw boasts far and wide, and soon produced a revolution outstanding results at the level of the university, and the University of Cairo in the Egyptian universities that responded to the demands of the revolution and the introduction of the principle of election of leadership courses in the framework of transparency and integrity start the election of department heads and deans of colleges and the end of the election of the President of the University. Dear friends.. Characterized by the Faculty of Information, Cairo University from other educational institutions, features single-family coherent, where melts faculty and teaching assistants, students, workers and workers in the crucible of one of mutual understanding and dialogue, and respect the other opinion, and study in the Faculty of Information check to schools fun unique through the acquisition of knowledge, skills and experience associated with the exercise of media work, as well as practical exercises and extensive field inside and outside the college in the framework of a scientific environment allows for diversity and competition and of tolerance and respect for the values and traditions handed down through the history of university, Cairo University. I appeal to male and female students may apply for positive participation in various activities, scientific, cultural, social, sport and contribute effectively in the activities of families, and the Student Union as voters and candidates, and to increase their communication with their teachers and with each other through the website developer for the College, and to make sure they meet regular tours academics to help in the selection of courses that fit the capabilities and potential of each student, and that we all seek to gain knowledge and positive interaction in the framework of mutual respect for the renaissance of our college and the richness of our university and upholding our beloved Egypt at home and abroad. 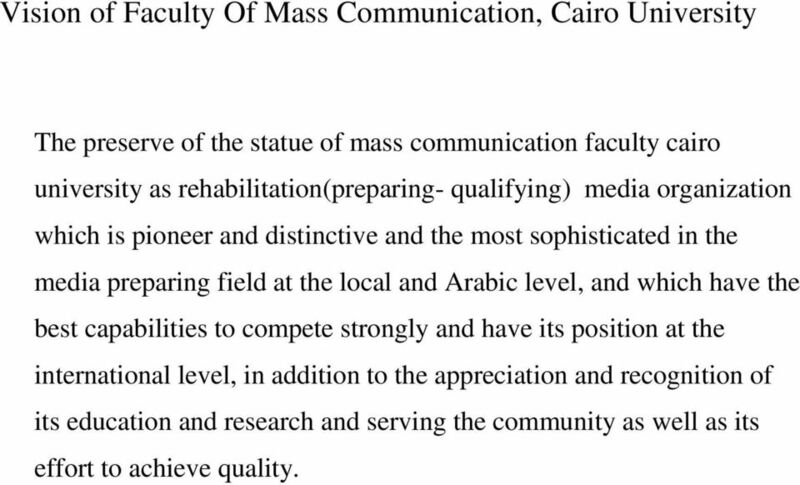 4 Goals of Faculty Of Mass Communication, Cairo University Principles and values: Education is one of the rights of human. Transparency, participation, interactivity and accountability are the basic principles to rule as education organization. Education is a lifelong process. The quality of education is multidimensional process( educational, administrative, technological and value) The measurement of the student s skills and knowledge is crucial element in their acceptance. Education is a life experience and integrated knowledge organization. Participation with the students is important in the evaluation of the educational process. The academic supervision is essential for the success of any educational program. The development of the critical thinking and creative abilities of the students. The interaction with local, regional and international variables. The regional exchange for students and professors. The variety of learning sources. The engagement to the society needs. Strategic objectives: First Objective: Developing of the studies system and programs to meet the requirements of the benchmark for media studies sector. 5 Second Objective: Developing of the studies system and programs to comply with the requirements of the local accreditation through the national institution for accreditation and quality assurance. Third Objective: Obtaining the accreditation. 6 Tactic Objectives: Developing the acceptance system in the faculty. Developing the study programs. Developing the practical training systems. 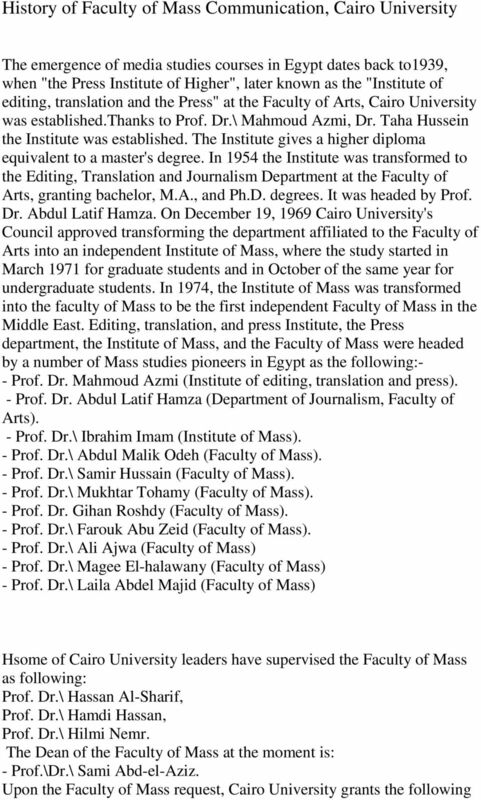 The establishment of joint degrees with distinguishes international media faculties. The establishment and implementing an inside system for quality. Developing the capabilities of the members of the faculty staff. Developing the library and information system and communication in the faculty. Dissemination of the culture of quality between the faculty staff and the administrators. Work Plan: There are group of initiative and activities which are time limited and achieve the strategic and tactic goals, and which is limited also by indicators to determine its success quantitative and qualitative, which include: The establishment of interior quality system. 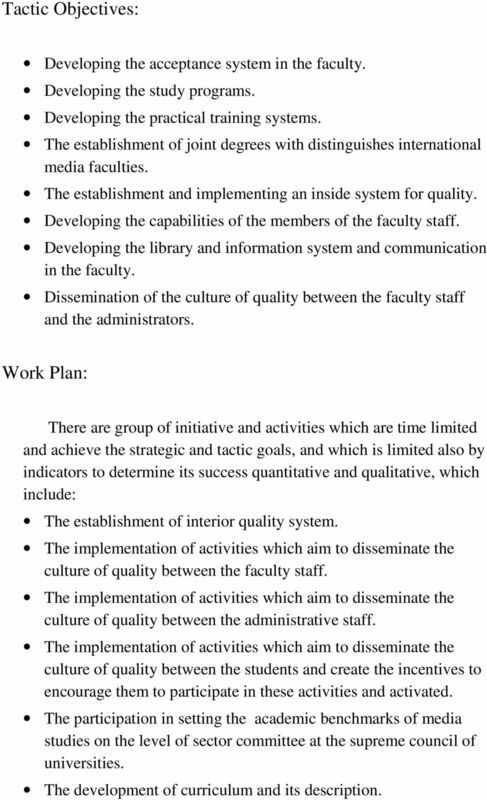 The implementation of activities which aim to disseminate the culture of quality between the faculty staff. The implementation of activities which aim to disseminate the culture of quality between the administrative staff. The implementation of activities which aim to disseminate the culture of quality between the students and create the incentives to encourage them to participate in these activities and activated. The participation in setting the academic benchmarks of media studies on the level of sector committee at the supreme council of universities. The development of curriculum and its description. 7 The employment of sophisticated education techniques. The establishment of joint academic degrees with the sophisticated media faculties around the world. The development of information and communication systems inside the faculty and preparing it for the implementation of electronic education programs. The implementation of programs to develop faculty staff capabilities. The development of library and data bases inside the faculty. 9 scientific degrees and diplomas: 1. B.A. degree of mass from one of the following sections: the press, radio and television, public relations and advertising. 2. B.A. degree of Mass (English section). 3. B.A. of Mass on electronic Press program. 4. Diploma of Mass (for two years). 5. French Diploma (one year). 6. M.A. degree of Mass. 7. Ph.D. degree of Mass. 8. B.A. of degree of Mass included in the Open University program framework. 11 Mission of Faculty Of Mass Communication, Cairo University Presenting the most qualified and distinctive services in education, training and research in the field of media rehabilitation in Egypt and the Arab world according to the standard of quality which is comparable with the international standard, and that through five parts: The first part: Connecting with the media organizations to deal with the media variables (digital revolution, globalization of media, the integration between media, the specialized media, multi- media, the communicator multi- capabilities and qualifications, the international and regional challenges.) The second part: The connection with the national, local and international media organizations and the continuous coordination with to identify its needs as beneficiaries. The third part: Contribute to the development of the manpower working in media organizations, media and communication sectors in all the production organizations and the governmental and private services. The fourth part: The continuous opening to the distinguish media centers in the world academically and professionally through scientifically and professional partnership and agreements (joint degrees). The fifth part: The dissemination of the sophisticated media knowledge through scientific research. 12 Vision of Faculty Of Mass Communication, Cairo University The preserve of the statue of mass communication faculty cairo university as rehabilitation(preparing- qualifying) media organization which is pioneer and distinctive and the most sophisticated in the media preparing field at the local and Arabic level, and which have the best capabilities to compete strongly and have its position at the international level, in addition to the appreciation and recognition of its education and research and serving the community as well as its effort to achieve quality. Curriculum Vitae. Dr.Shereen Abdul Hafez Metwaly, PHD, Msc.,MBA, CPHQ. Establishing a media project that focuses on multimedia reporting, photojournalism and videojournalism. In addition candidates are expected to have obtained at least grade C+ (minus) in each of the following cluster subjects in KCSE examinations.